The eLOAD (electricity LOad curve ADjustment) model aims to estimate the long-term evolution of electricity system load curves on a national level. 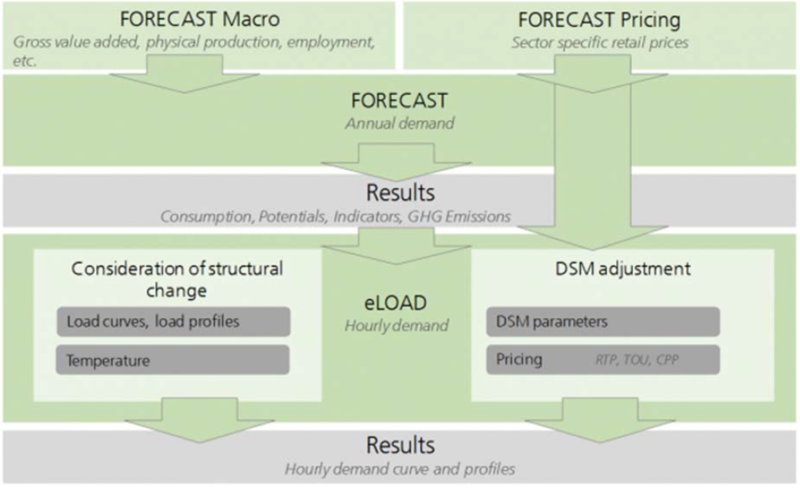 Based on appliance specific hourly load profiles and annual demand projections from the FORECAST model eLOAD assesses the transformation of the load curve due to structural changes on the demand side and the introduction of new appliances. Analysing the future shape of the load curve gives insights into the development of peak load, load levels and load ramp rates that are required for investment decisions about new electricity generation capacity and grid infrastructure. Apart from that, eLOAD allows to analyse load flexibility, i.e. demand response (DR). Based on a mixed-integer optimisation the model determines cost-optimal load shifting activities of suitable appliances such as electric vehicles or storage heaters, considering their techno-economic constraints as well as distinct dynamic tariff mechanisms. eLOAD consists of two modules. The first module addresses the deformation of the load curve due to structural changes on the demand side and the introduction of new appliances (such as electric vehicles) by applying a partial decomposition approach (PDA). The technology specific annual demand projection from the FORECAST model serves for the identification of all “relevant appliances” that feature a significant increase or decrease in electricity consumption over the projection horizon. By using appliance specific load profiles, a load curve can be generated for all relevant appliances for the base year, according to the respective annual demand in the base year. These load curves are deduced from the system load curve of the base year. The resulting remaining load curve and the appliance specific load curves are then scaled for all projection years according to the demand evolution. Reassembling the scaled remaining load and the scaled load curves gives the load curve of the projection year. The main advantage of the PDA consists of its ability to properly take into consideration structural changes in overall annual demand by explicitly modelling the main drivers for load curve deformation while preserving stochastic outliers and characteristic irregularities from historic load curves. Using the results from the FORECAST model entails the benefit of integrating the assets of bottom-up simulation modelling. This ensures an appropriate representation of a large variety of appliances, of the diffusion of new technologies, of the evolution of techno-economic characteristics as well as the consideration of macro-economic drivers and political measures. The second module of eLOAD addresses the active adjustment of the load curve by means of DR. The net load is defined as the overall system load curve minus the generation of RES. Smoothing the net load enables an efficient operation of existing electricity generation assets and grid infrastructure as well as a diminished need for investment in new capacities. A major input of the DR module consists of hourly electricity generation profiles from renewable energy sources. Net load smoothing is carried out by determining the optimal load schedule for appliances/processes that are particularly suitable for DR. The optimisation is performed from the consumer perspective. A consumer group receives a day-ahead price or net load signal. Based on the electricity consumption pattern (i.e. the load profile) of the respective process as well as techno-economic parameters and restrictions (e.g. capacity, storage or organizational constraints), a mixed-integer optimisation is carried out to determine the least-cost scheduling of the load. The DR module delivers a quantitative load shifting potential, providing detailed information about the seasonal, weekly as well as hourly load shifting availability of the individual appliances. It generates a smoothed net load curve that may be used in an electricity market model to quantify the impacts of DR on the electricity system. The role of eLOAD in this project is two-fold. First, eLOAD translates the annual electricity and heat demand projections delivered by the FORECAST model into hourly load curves. Therefore, eLOAD makes use of the underlying partial decomposition approach and thus accounts for the changes in the structure of future electricity demand, when determining the shape of the future load curve. While electricity load curves serve as an input for the electricity market models ELTRAMOD and PowerACE, the heat load curves are transferred to the TIMES-Heat model. Second, eLOAD is required to estimate technology distinct DR potentials. These potentials are characterised by seasonal, weekly and daily variations and depend on the dynamic tariff mechanism considered. In combination with the modelling results from FORECAST, the eLOAD results allow to draw conclusions on the potential contribution of DR for peak load shaving and the integration of renewable energy sources and on the extent to which the potential is affected by energy efficiency policies. In addition, the DR potentials are used in the ELTRAMOD model in the framework of a system optimisation approach that determines the cost-optimal mix of flexibility options to ensure a stable European electricity supply system. The results on DR potentials generated with the eLOAD model are further refined within the framework of the project due to the research efforts related to technological learning curves and the planned demand side management survey. The integration of learning curves focuses in particular on demand control technologies, such as smart meters, building automation systems, DSM control infrastructure and other DSM technologies required for more flexibility in the electricity system. Considering the potential cost reduction of these technologies in the dissemination of flexible electricity consuming appliances allows determining the DR potential more thoroughly. The DSM survey will foremost deliver additional insights about techno-economic constraints and organisational barriers of commercial electricity consumers to participate in DR programmes. They will be additionally included in the optimisation approach of eLOAD to obtain a more realistic reproduction of DR behaviour of commercial consumers. Scenario-based analysis of the national electricity demand, load curves and DR potentials until 2035 for different European energy utilities. Boßmann, T.; Staffell, I..: The Shape of Future Electricity Demand: Exploring Load Curves in 2050s Germany and Britain , Energy Journal, under review, Karlsruhe, 2015. Klingler, A.; Boßmann, T.: Technologiebasierte Lastmodellierung vor dem Hintergrund von PVStromerzeugung und Lastmanagement, 9. Internationale Energiewirtschaftstagung an der TU Wien (IEWT 2015), Wien, 2015. Jakob, M.; Kallio, S.; Boßmann, T.: Generating electricity demand-side load profiles of the tertiary sector for selected European countries, 8th International Conference Improving Energy Efficiency in Commercial Buildings (IEECB’14) , Frankfurt, 2014. Boßmann, T.; Pfluger, B.; Wietschel, M.: The shape matters! How structural changes in the electricity load curve affect optimal investments in generation capacity, 10th International Conference on the European Energy Market (EEM13), Stockholm, 2013. Boßmann, T.; Elsland, R.; Lickert, F.; Wietschel, M.: The German load curve in 2050: structural changes through energy efficiency measures and their impacts on the electricity supply side, Summer study on energy efficiency (ECEEE 2013), Hyères, 2013. Boßmann, T.; Elsland, R.; Lickert, F.; Wietschel, M.: The German electricity demand in the year 2050: Structural changes in the load curve and their impact on the supply side, 8. Internationale Energiewirtschaftstagung an der TU Wien (IEWT 2013), Wien, 2013.